Recently I had lunch with Gary Grunner, a wine importer who is very passionate about Soave, the white wine from the Veneto. We were at SD26 in NYC and Gary brought one of my favorite Soaves from Tenuta Santa Maria Alla Pieve winery to drink with lunch. Gary said that Gaetano Bertani established Tenuta Santa Maria Alla Pieve in 1991. The property had been owned by the Bertani family since the 1860’s and managed by Gaetano since 1971. Today Giovanni and Gugliemo, his two sons, assist him. Gaetano is the wine maker and the consulting enologist is Franco Bernabei. 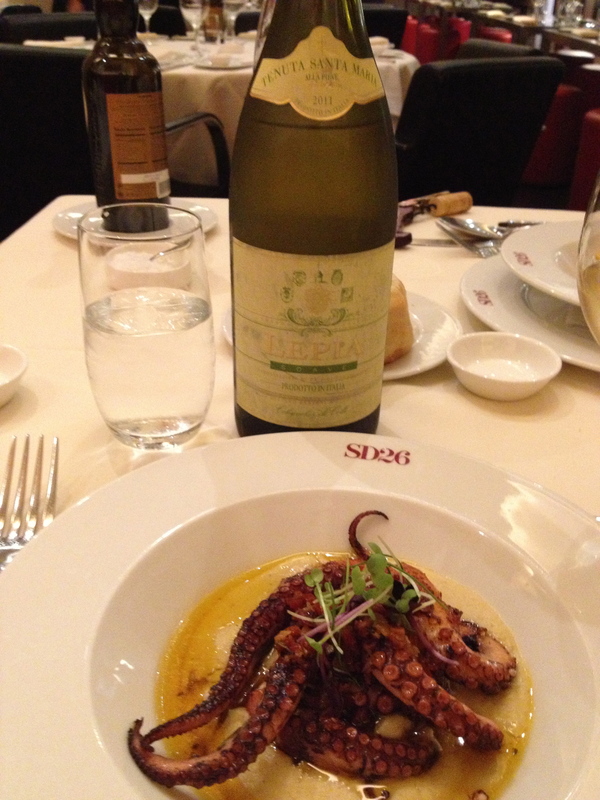 The wine went very well with both the octopus I had as a first course and the sea food ravioli which followed.